When you find out you're expecting again it is, of course, a very exciting time. After the initial happy and excited bubble has popped and the realities of having another baby sink in, one of your worries may be how your child(ren) may react to a brother or sister. Whilst for the most part I was extremely excited to see how Darcie would react to her baby brother, I was a little apprehensive too. Would she be accepting of this new bundle of joy? Would she be resentful? Or would she just completely ignore him altogether?! Thankfully Darcie has been super accepting of Henry and has taken to him so well. Their bond is already so beautiful, with him smiling (for the first time ever!) at her and Darcie constantly showering him with kisses and declaring they are going to be best friends forever. So how can you prepare your child for the arrival of a sibling? Darcie came to near enough every appointment and scan we had (I had seven scans in total! ), my midwife got to know Darcie really well and got Darcie to "help" with my checks. She would help feel my tummy to check babies position, help check the heartbeat and quite often my midwife would even give Darcie a list of jobs to do. These were things like, reminding me to pack my hospital bag, take my aspirin or to just talk to baby. Our midwife was such a diamond and I really think she helped with Darcie's understanding of what was happening. We got Darcie a couple of books as well to help further her understanding. They included 'Big Sister' by Marianne Richmond which goes through all the changes that mum has to go through too which is particularly nice to get them to understand that perhaps you can't do all you did before. Once baby was here we made a "big deal" of her becoming a new big sister. Henry got her a few gifts and they had lots of cuddles whilst I was in hospital. Once home and visitors started to arrive, they too made a big deal of Darcie becoming a big sister. A couple of them also gave her gifts, cards and even a bunch of flowers in celebration of her new role. Now over a month on, I feel Darcie has coped very well the change. At times I get frustrated when she kisses him for the thousandth time that day, though I know it's only her way of showing him affection, especially as their interaction is quite limited at the moment. I love how when Henry cries Darcie is there with a song ready to soothe him. Or when they're playing on the playmat together he would rather stare at her than the toys. Sibling love is such a wonderful thing and I'm loving watching how their bond adapts and grows. 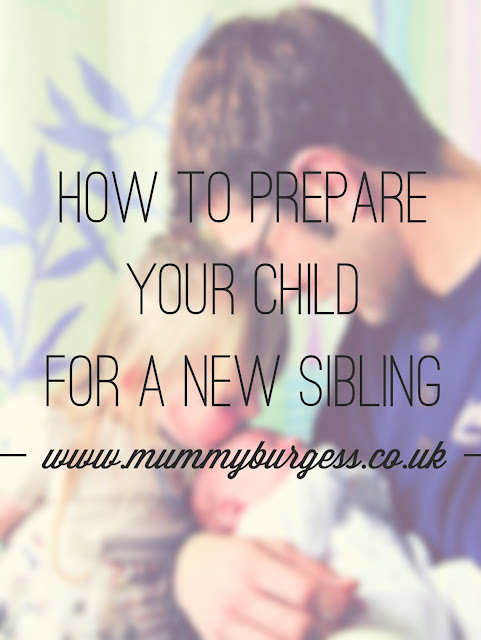 What would be your tips on preparing a child for the arrival of a new sibling?